The world of salt has expanded far beyond simple white table salt. With such a dizzying array of salts available, it's difficult to know what to choose. This primer will help you understand the world of gourmet salt. Sea salt is a broad category of salts available that are harvested from the sea. Sea salts are available from locations all around the world. You can find small and coarse grained sea salts from all over the world, including Italy, Spain, Hawaii, and many other places. Sea salt has a more savory flavor than table salt, so you need less for seasoning. Use fine grain sea salts in soups and stews, to season uncooked meats, and to season dishes as you cook them. Use coarse grain sea salts as a finishing salt on cooked meats, vegetables, potatoes, and other dishes. Grocery stores often have their own brands of sea salt, as do most gourmet cooking shops. Fleur de sel salt is a type of sea salt harvested by hand from the top layer of the salt plains off the Brittany Coast in France, as well as in other countries including Spain, Portugal, Brazil, Canada, and Yucatan. It is a finishing salt with medium-sized crystals. The crystals are relatively youthful compared to other salt crystals. The crystals form naturally on the top of the salt ponds, and they are raked using wooden tools. Fleur de sel is used after cooking, not during, because it is prized for its flavor. Sprinkle a little on cooked meats or roasted vegetables. You can purchase fleur de sel at high-end gourmet and grocery stores. Online, Williams Sonoma sells fleur de sel for about $13 that was harvested off the island of Ré; if you need a large quantity, check out Saltworks which offers 40-pound bags for about $435. This flaked sea salt hails from the waters of the Pacific Northwest. The flakes dissolve quickly on the surface of meats or vegetables, and the salt is intended as a finishing salt. Snowflake salt is available at Mountain Town Olive Oil Co. for around $5. Also known as Celtic sea salt, this coarse-grained gray sea salt gets its color because the salt comes in contact with the bottom of the salt pan before it is raked. This salt is denser than table salt, and therefore much "saltier". It can be used as a cooking salt, but cooks should reduce the volume by half if a recipe calls for table salt. Sel gris also makes a fantastic finishing salt. It is used in French cuisine. Buy sel gris at Sur La Table for about $13. The Japanese make this sea salt by evaporating sea water over fire and then crystallizing the salt over fire. This results in a very fine grain. 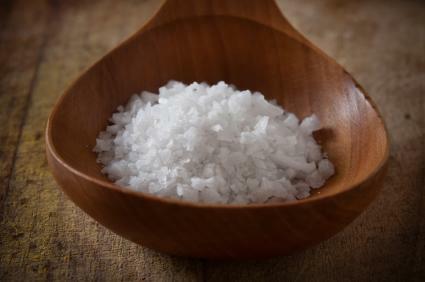 The salt has a clean flavor, and it is used in Japanese cuisine. Use it as a finishing salt on seafood, steaks, or vegetables. Shio salt is available from The Meadow in a 10-pound bag for just over $40. Himalayan salt is rock salt from the mountains in Pakistan. The salt crystals come in an array of colors, and it can be used for cooking and finishing. The most common form of Himalayan salt is the pink salt. The coarse crystals of this salt make a delicious finishing salt. For a finer grain, Himalayan pink salt also makes an excellent grinding salt. 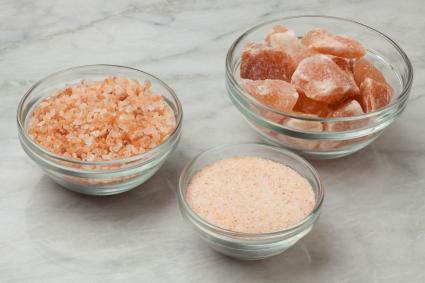 When purchased in slabs, Himalayan pink salt serves as a platter upon which you cook foods, imparting a light seasoning. You can find Himalayan pink salt at the health food store, in gourmet food stores, and in grocery stores. It is also available on Amazon.com in prices that range from around $8 to $12 for about a pound of the grains, depending on the brand chosen. Many gourmet suppliers and grocery stores offer smoked salt. While the type of salt smoked is typically sea salt, manufacturers can use any type of salt with any grain. The salt is usually dark gray to black in color, and the grain may be small or large depending on the type of salt used. 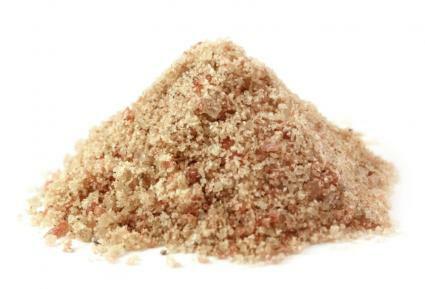 Use large grained smoked sea salt as a finishing salt on meats or vegetables. Use smaller grains in recipes, such as homemade barbecue sauce or to add smoky flavor to a soup, but beware - a little goes a long way. Start by using just a little, and then taste and adjust as you go. Salt can be smoked with many types of wood. Williams-Sonoma offers hickory salt for about $10. Kala namak, which is also known as Indian black salt or sanchal, is a black salt used in Southeast Asian cooking. While the salt is primarily sodium chloride, it also has a relatively high sulfur content, which gives it pungency. The salt is used in many spice blends, including the Indian spice blend chaat masala, as well as in dishes, chutneys, and other regional cuisine. It can also be used as a finishing salt. You can find Kala Namak at Asian grocery stores, as well as in gourmet shops such as The Meadow, where it sells for less than $5. Many gourmet manufacturers now make flavored salts such as truffle salt or roasted garlic salt. Typically, these finishing salts are made from sea salts that have extra flavors added, so they can add interest to any thing you use them on. Try seasoning vegetables, grains, or proteins with these salts to add an additional pop of flavor. Fusion has a line of flavored sea salts available at Saltworks. Just a few of the flavoring options include chipotle, lemon twist, matcha, and Vermont maple. Retail pricing runs about $15 or so, depending on the flavor chosen. Kosher salt is a flaked salt used in cuisines around the world. Kosher salt is traditionally used in the koshering process, in which it is applied to meat to draw the blood to the surface. Kosher salt is used in place of table salt in cooking. Because it is less dense than table salt, it is less "salty" tasting. Therefore, cooks may need to add 25 to 50 percent more salt to achieve the same flavor. Kosher salt is a good ingredient for seasoning meat prior to cooking, because the flakes dissolve quickly and absorb into the meat. It isn't a good salt for baking. Kosher salt is available in the grocery store baking and spice aisle, as well as online through brands like Morton Salt, which sells a two-pack for about $8. Grinding salt is a finishing salt, typically presented at the table so diners can add their own salt to their food. It comes in large crystals of sea or Himalayan salts, which are placed in a salt grinder and ground. Most grocery stores offer grinding salt and grinders. It's an affordable salt from Morton Salt, who sells the filled grinder for around $6. Using different salts will bring flavor, texture, and interest to your food. Try some of the above salts to find those you like best.